Diabetes is a common disease all over the world. Both type 1 and type 2 diabetes happen when the beta cells located in the pancreas fail to produce insulin. Insulin in a hormone that keeps sugar related within the body. Since this has been known for years of medical research, researchers believe that one method to treating diabetes is to encourage redevelopment of new beta cells. This entry was posted in Stem Cell Research on January 21, 2013 by admin. Diabetes, particularly type 1 diabetes, is a very serious illness that requires daily monitoring of blood glucose levels and, even if properly treated, can still lead to a number of lifelong ailments. Complications due to diabetes are one of the top ten killers in America, and it has been estimated that over two hundred thousand people die from diabetic complications every year. Clearly, with such grim results, the search for a cure for diabetes is one of the holy grails of medical science. Currently there is no cure for the disease, but there are several promising technologies on the horizon. First, there is the closed loop insulin pump which, in many ways, acts as an artificial pancreas to keep insulin levels where they need to be. Another promising technique is to replace the islet cells, which are the cells in the pancreas that are necessary for the production of insulin. The third technology, and the one that holds the greatest promise of a complete diabetes cure, is the possibility of growing new islets cells from undifferentiated stem cells. The closed loop insulin pump is a device that is currently in development that will continuously monitor levels of blood glucose and subcutaneously dispense insulin into the bloodstream as necessary. The disadvantage of this technology is that the pump must be worn outside the body and supplied with an external source of insulin. Additionally, since it is a highly complicated computerized mechanical device, there is the very real threat that a closed loop insulin pump could malfunction. Another possible cure for the disease is the islet transplant. In this treatment, islet cells from a healthy donor are injected into the diseased pancreas. While this technique has proven marginally effective in clinical trials, it carries with it a host of difficulties. The most serious problem is the threat of rejection. Since the immune system will recognize the transplanted islet cells as foreign bodies, it will destroy them. The only way to prevent this from happening is to take medication that decreases immune function. This is a drastic measure that can lead to a host of other problems due to the increased possibility of infection and cancer that occurs when the immune system does not function properly. While islet transplants and closed loop insulin pumps are not perfect, they are both in the testing phase and could impact millions of diabetics within few years. However, there is a much better treatment possibility, one that promises to be a true cure with many fewer side effects, that may become a reality in the future. 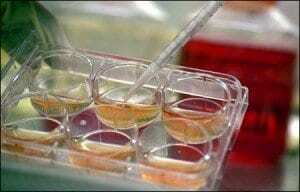 This is the possibility of growing new islet cells from the patients own stem cells. This would provide new, functional islet cells that will not be attacked by the immune system since they have the same markers as other cells in the body. Stem cell research is a hot button issue politically because of the, mistaken, assumption that stem cell research requires the destruction of a human fetus. While it is true that the richest source of human stem cells do indeed come from fetal tissue, there are many other ways to harvest stem cells. If the political hurdles can be cleared and dedicated research into stem cell technology is allowed to progress, we could see a true cure for type 1 diabetes within the next few decades. This would forever remove the effects of this terrible disease from our lives. Additionally, stem cell research could also be used to treat many other disorders, including nerve and retinal damage that can occur as a side effect of diabetes. The sky is truly the limit for stem cell technology. This entry was posted in Stem Cell Research on June 30, 2010 by admin. While the American Diabetes Association (ADA) is backing embryonic stem cell research doctors in India may have found a way to use existing stem cells in your own body to help with some of the most negative effects of diabetes. A common problem for patients is a marked decrease in blood circulation in the lower limbs. Peripheral Artery Disease is often the result and is a condition that can often mean amputation for diabetics. It is with that background in mind that the following story was related to doctors in New York recently at the Cardiovascular Research Foundation. A 64 year-old patient had already lost one leg and the big toe on his remaining leg to amputation caused by Peripheral Artery Disease. The latest diagnosis indicated his remaining leg might also need to be amputated. These stem cells pulled directly from the patients own bone marrow allowed pain relief in a month, walking in two and normal activity within three months. The leg was not amputated and the patient improved dramatically. Dr V Balaji, vascular surgeon, Apollo Hospitals indicated, “Science is demonstrating that adult stem cells regenerate ischemic arteries by stimulating angiogenesis in the areas of damaged tissue, thereby restoring proper blood circulation to the limbs.” These were limbs that were routinely amputated until recently. This study was conducted by the department of vascular surgery at the Sri Ramachandra Medical College Hospital and Research Institute in Chennai, India. The prevailing understanding of this study is that by relocating adult stem cells that exist in your body it may be possible to help correct damage caused by diabetes and other ailments. This may be over simplified and certainly the medical community at large will want to see more studies before implementing such a procedure on a nationwide basis, however there is one 64-year old in India who is quite pleased that doctors were able to relocate stem cells and save his leg in the process. There remains some debate about the ethical use of embryonic stem cells, but the approach in this report harvested stem cells from the patient using blood from their own bone marrow. Those compatible stems cells were then reinjected into areas where improvement was needed. The finding seems to indicate unprecedented success and may serve to foster greater research into adult stem cells as a means of improving the quality of life for diabetics. Adult stem cell research in Germany has provided vital clues as to the effectiveness of this type of treatment and provided countless success stories as well. We may find that our own bodies may provide some of the best answers to managing the worst of diabetes. The American Diabetes Association (ADA) made it clear they were in favor of embryonic stem cell research. The current US administration agreed and lifted a ban on the research imposed by former president George W. Bush. Whatever impact may ultimately develop from this news may not be felt for several years. Standard safety concerns need to be addressed in each potential study on the stem cells. Scientific examination is also required in many cases. Several billion dollars have already been dedicated by private parties to the establishment of stem cell research along with facilities where advances may be studied. The change in policy could open up federal funding for stem cell research, but that will be up to congress. Some suggest this is the best way to accelerate therapies using stem cells. Opponents of the policy argue embryonic stem cell research sacrifices one life for the potential benefit of another. As noble a gesture as that may be there are those that find the idea repugnant. In turn they will cite advances in adult stem cell therapies that have also yielded hope and promise. They voice concern that while adult stem cell research has provided answers this has not been the case with embryonic stem cells to this point. While this argument may have merit the counter argument will be that by opening stem cell research up to embryonic stem cells it may be possible to accelerate potential new treatment options. One of the reasons embryonic stem cells are viewed as a potential winner is that researchers are convinced they are much more adaptable to the type of cells they will need to replace. The last sentence will be the issue science will need to master. If, for instance, a patient is treated for diabetes using embryonic stem cells and those cells morph into cancer the patient will not likely view the therapy as an acceptable trade off. Ethical questions surrounding this new development will likely linger, but it has served to open new dialogue and has medical science excited about virtually any kind of stem cell research that can improve the quality and length of life of patients. Prior to president Obama’s change in policy there had been strides in embryonic stem cell research that offered potential therapies for a variety of medical conditions including diabetes. Due to multiple factors those potential therapies hadn’t moved beyond the ‘potential’ category. Several questions remain, but the policy change has ignited the medical community as they look at new ways to help their patients. What if a newly diagnosed Type 1 diabetic could engage in a procedure that would radically improve their prognosis? What if that procedure could make insulin injections unneeded in some cases? These were questions considered in a study conducted in Brazil as part of an adult stem cell trial. The reported findings are relatively new although the research was conducted over several years. Twenty-three patients participated in the study. They ranged in age from13-31 and all had been recently diagnosed as Type 1 diabetics. This therapy is known as autologous nonmyeloablative hematopoietic stem cell transplantation (HSCT) and relies on identifying new Type 1 diabetics and beginning the procedure before the majority of insulin producing cells is destroyed. This treatment would not be effective on patients who have been Type 1 for an extended period of time. The majority of these patients improved. Their body’s were able to produce enough insulin to cease insulin injections for an average of 2.5 years. WebMD describes the process. “Soon after diagnosis, the patients were given drugs to stimulate production of blood stem cells. The blood stem cells were then removed from the body and frozen. “Patients were hospitalized and given the toxic drugs that killed their circulating immune cells, and then the harvested blood stem cells were put back into the patient. [Twenty] of the  patients treated with the experimental therapy were able to do without insulin injections or greatly reduce their insulin use for a few months to several years. In a Type 1 diabetic the immune system mistakes insulin producing cells for a ‘body invader’ and the immune system begins to kill those cells. In this study harsh immune suppressing drugs are used to keep the body from destroying what insulin producing cells might remain. The introduction of the body’s own stem cells is then used to encourage the body to use the stem cells to create more insulin producing cells. More results from the study can be found in the April 15th, 2009 edition of the Journal of the American Medical Association. Banking on multiple years of follow up with diabetic patients involved in the study researchers are hopeful that the Food and Drug Administration (FDA) will allow a larger study to be conducted to gauge the effectiveness of this adult stem cell therapy. The side effects remain a concern for those in the medical professional along with their patients, but many will tentatively consider this a breakthrough in potentially treating Type 1 diabetes. This type of diabetes has not been known as one that could be taken care of through diet and exercise alone. The advances in adult stem cell therapy have been documented in other diabetic studies including one for the saving of lower limbs due to poor circulation. This study provides some additional good news for those engaged in stem cell research as well as the patients who rely on that research.